Rachel shares an easy and healthy, no cook raw recipe. The chocolate ganache layer is enriched by coconut oil. There are two overriding principles to most of the food I cook: it can’t involve any processed ingredients (I say "most" because there are exceptions, I think margarine makes a much better Victoria Sponge, for example), and the ingredients I do use must be easy to come by. I love visiting independent stores, farm shops and farmers markets, but I must also be able to pick up whatever I need last minute from the supermarket, too. Coconut oil first came on my radar when I was living in Los Angeles a few years ago, but it was not until recently when I started to see a good choice of both independent and own brand raw cold pressed versions popping up on supermarket shelves, did I start to see it as an ingredient that I’d buy and incorporate into my everyday cooking. I attended a cooking demo for Vita Coco’s new coconut oil, hosted by the Hemsley sisters a few months ago, which was a really great crash course in what I could use the oil for, as in my mind it was simply just a component in my American roommates' vegan baking. Aside from being a great natural fat, (and as I’ve discovered great as a lip balm, moisturiser for dry skin and great for adding shine and moisture to your hair) it is a wonderful all purpose cooking oil. They showcased it as a soup base, and also good for greasing the pan when you’re making those little muffin tin frittata things. Personally, from tips I picked up from the demo I’ve loved adding a tablespoon to my smoothies to make them a little more filling and creamier, and I’ve been making the most delicious scrambled eggs by using coconut oil instead of butter; I’ve been making them dairy free ever since. From my own experimentation, I’ve been using coconut oil when I’m tossing up my Asian veg in the wok for a bit of extra flavour. For dessert, Jasmine and Melissa whipped up a Mint Chocolate Pavé, which consisted of great little squares of chocolate and mint ganache made with coconut oil instead of the usual cream, and with no refined sugar. They used raw honey and vanilla extract (which tricks you into thinking something tastes sweeter than it actually is) instead. I was particularly blown away by the chocolate ganache layer, so I started thinking about how I could make this into some sort of bar I could stash in the freezer (coconut oil is only solid below 23 degrees) at home for whenever I fancy something sweet. 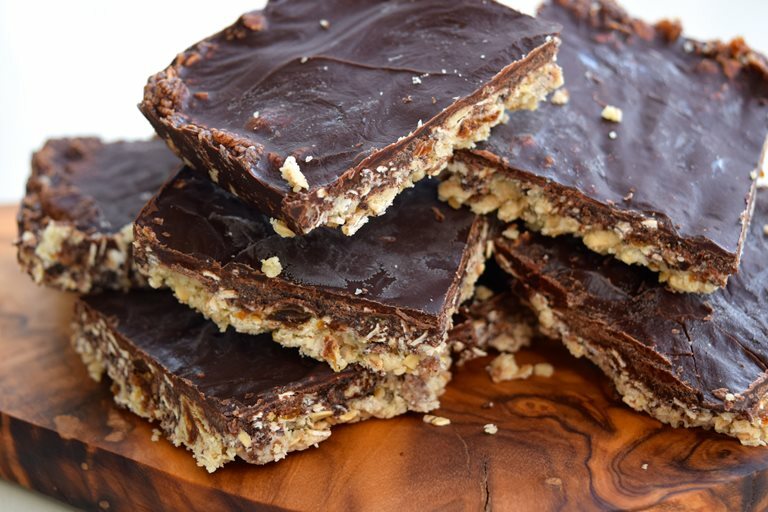 My first port of call was to email my friend Amy, who as well as having coeliac disease, keeps to a vegan diet (but still loves to cook and bake), to see how she’d go about making a crunchy bar like base for my coconut oil chocolate ganache topping, which I’ve adapted a little from the Hemsley + Hemsley recipe. Vegan margarine was part of her reply, and I countered asking her how she’d do it using ‘normal’ ingredients. While I do agree with her that ‘vegan margarine is a normal store cupboard ingredient for vegans!’, I still wanted to come up with a relatively easy and healthy, no cook recipe that just happened to be raw and vegan (in everyday baking I’m still very much married to my sugar, eggs and butter) made with everyday ingredients anyone would usually buy and enjoy.